Peter Hickman made his Isle of Man TT debut in 2014 on the Ice Valley BMW. 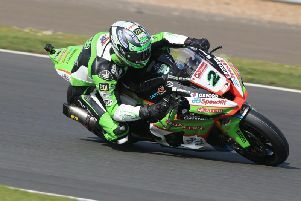 English rider Davey Todd shot into second place in the Isle of Man TT’s top 10 newcomers list in 2018 after a sizzling debut for Northern Ireland’s Burrows Engineering Racing team. The 23-year-old made eye-catching progress through race week, culminating in a superb lap of 128.379mph as he claimed a top 10 finish in the Senior TT. Davey Todd on the Burrows Engineering Racing Suzuki in the Senior TT in 2018. Peter Hickman, who raised the outright lap record around the Mountain Course to 135.452mph when he powered to victory in last year’s Senior race, remains the leading newcomer after his lap of 129.104mph set in 2014. Here are the top 10 fastest newcomers ever at the Isle of Man TT. British Superbike rider Josh Brookes was a high-profile TT newcomer in 2013.